Pigging is the most common application carried out to clear the pipelines during the maintenance. Pig launcher and Pig receiver are used to launch pig and receive it at the end of pipeline. During pigging operation it is extremely important to depressurize and drain completely the pig launcher vessel/shell and then load the pig in the system by opening pig launcher door. Similarly before releasing the pig from the receiver, depressurizing and draining operation are conducted by isolating receiver from the main line. At any stage doors can be opened when launcher or receiver are under pressure. This can cause non-repairable accidents and damage to life and equipment. To avoid this situation Valve Interlocks are mounted on the Drain, Vent and Isolation Valves. 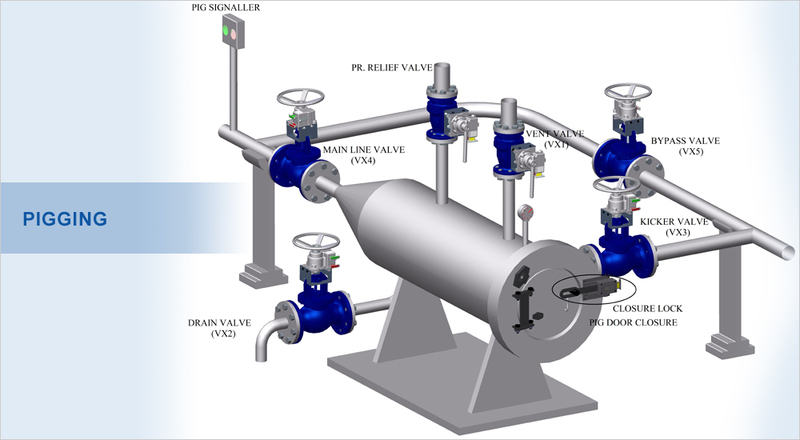 Valves are operated in a sequence to conduct safe operation ensuring Launcher and Receiver doors can be opened only when system is completely drained and depressurized. Coded keys are used to open the Valve Interlocks in predetermined sequence as per client design. Valve Interlocks are specially designed to handle complex operations with ease.